Work hacks? 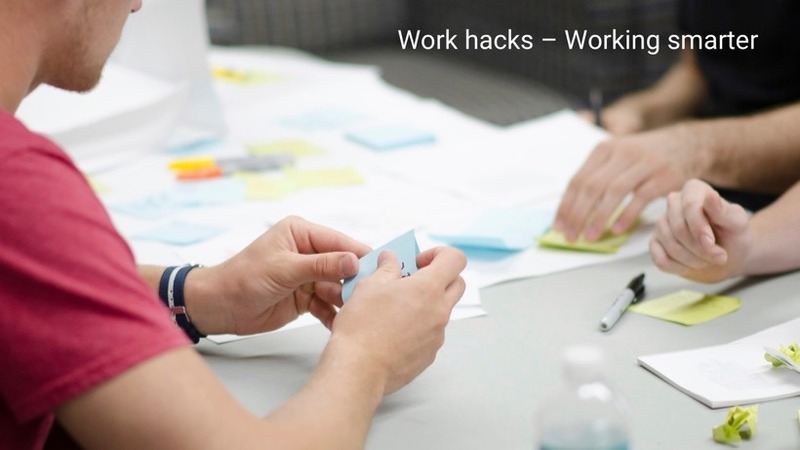 Work hacks are simple yet original methods that can be used quickly and directly to improve teamwork and work results. Work hacks are selected and tested by teams themselves. “Hacks” that work well can be incorporated into the workday, while those that don’t are simply set aside. The time required is minimal, but the effect can be enormous. Work hacks provide an easy introduction to cultural change and break up established routines. Teams decide from the bottom up what to change and can implement it directly. Who’s never experience this: No sooner have you started on a task or a project than you are already torn away – by a telephone call, friendly colleagues, or an e-mail. On average, however, it takes 15–18 minutes to get back into a topic. Concentrated, undisturbed work can sometimes be quite a challenge. The solution? Focus time. That is: a certain period of time in which you can work undisturbed. How this focus time is implemented can vary considerably. Every employee can tweak things themselves. For example: switching off e-mails and telephone, doing home office, or withdrawing to a quiet area. But it’s also possible to work together as a team and set a specific focus time during the week in which everyone can concentrate on their topics. Incidentally, focus time is also perfect for higher-level focus topics or important strategic questions that are rarely encountered in daily work. A small extra tip: Studies show that even smartphones can be a major disruptive factor at work, thereby reducing productivity. Just leave your smartphone in your pocket or set fixed times at which you check your smartphone. It works wonders! Four-day week and Co. – We work so flexibly! Work hack # 2: Eat the frog first!